This gentle old man was rescued after 13 years in a neglectful outdoor situation. He weathered many storms, though spent the last four months of his life in a warm, loving home with plenty of protection and lots of treats. He fell right into place as one of the "pack" with brothers Grizzly, Teddy and James Bond. Everyone in the Riebe household will surely miss this really good guy. RIP Spike. This handsome, quiet soul was rescued from a neglectful situation in early September 2013. By September 25, the difficult decision to put dear Teddy Bear down had to be made. Teddy Bear was diagnosed with a twisted stomach, and the disease had progressed too far to operate. 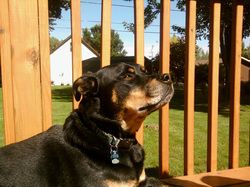 Teddy Bear was a 6-year-old husky/rottweiler mix with a wonderfully gentle temperament. Fortunately, he was able to experience the kind and compassionate side of humanity before his passing. RIP Teddy Bear. 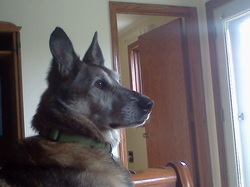 RIP Daphne - 1/31/2013 - We know you were greeted today at the Rainbow Bridge with excited barks and wagging tails. Your new friends there will listen to your stories of the wonderful foster home you had. How you sat in the kid's laps and felt their gentle hands on your head. How foster mom would hold you close and tell you only better things were in store for you. Your new friends will be happy about how you played with a sock for the first time in your life! Those friends will now be your forever family and run and play with you, chasing butterflies and rolling in the grass. This is not the forever family we thought you would have, but sometimes God has different plans. Run free, little Daphne. Your GBAR family loves you. Our hearts are very heavy tonight. 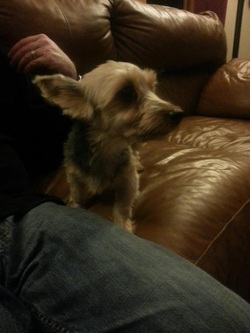 Our little silky terrier, Daphne, went to the Rainbow Bridge today. Her spay surgery and dental went well and as she was being carried to recovery, her heart stopped. Our vet did CPR for over 30 minutes trying to revive her, but she didn't respond. We know she received the best possible care and we appreciate the efforts that were made to save her. We are so very thankful that Daphne was fostered with Melissa and her family. 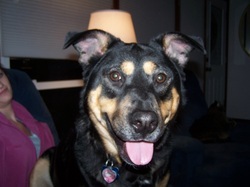 Daphne had love, attention and a real HOME. They were the best few weeks of her short life. We are grateful to Jeanette, who had hoped to adopt her and was excited about Daphne joining her family. Daphne was loved by many and will not be forgotten. I write this post in celebration of Caleb's life and the amazing transformation he has made since coming to us to be fostered and ultimately being adopted into our family. This is not a sad time for us...we are thankful we were able to show him that people can be good and trusted. We are thankful that we can see it's time and have the courage to let go and not let him linger when his quality of life is diminishing - just because we are afraid of letting go. We have said "see you later" - never good bye. Caleb was not sent to us for ourselves - he was sent for everyone to be touched by his courage, braveness & determination. Emma Jean...My favorite block-head doing her favorite thing....recharging her solar panels :) RIP Emma Jean (1/6/2006-7/2/2010)...my 4-legged Diva. The pain is gone, go be a "ball-tard" all day, everyday :) Your smiling rottie head and husky tail will forever be in my heart. We got 4 1/2 spectacular years and a ton of laughs....see you again sweet girl. Ten years ago I received a call about an adult long haired black cat roaming the busy streets near the hospitals on Webster Ave in Green Bay. A kind gentleman named Raymond was feeding him from his garage. I went and got the cat, and named him after that kind man. Raymond the cat was graceful and handsome and had a wonderful attitude towards all the other rescues that came through our home. He always answered to his name with a very loud meow. 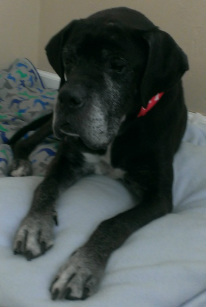 Sadly, due to a stroke and heart disease I had to make the decision to end his suffering and had him euthenized on February 6th, 2012. Raymond, you beautiful soul, I am thankful for the years I had with you. I love you. We fought for 4 months. We can see you are tired. Today we let go of a special pup that taught us that every day is a blessing. Your whole body wagging tail, always smiling face and sparkling, dancing eyes will never be forgotten. 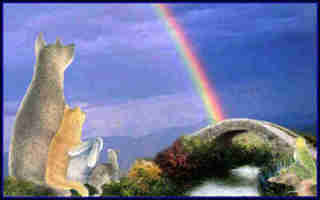 Go to your sister Emma, she is waiting for you across the rainbow bridge. Rest in peace Izzabella Mae...you are loved and will be horribly missed. We take comfort in knowing your pain is gone and you will once again be healthy. Oliver was a 12 year old rat terrier that was Racquel's first puppy on her own. He had cancer and passed away in February of 2012 peacefully at home, which fueled Racquel's passion for wanting to foster and help animals in need. RIP Ollie B! You are missed!